As the sign says, this sign (in Blandford, Massachusetts, if I recall correctly) marks the highest point on the Massachusetts Turnpike. Can you spot the grammatical error? By 2001 I had passed this sign several times and it always bothered me. 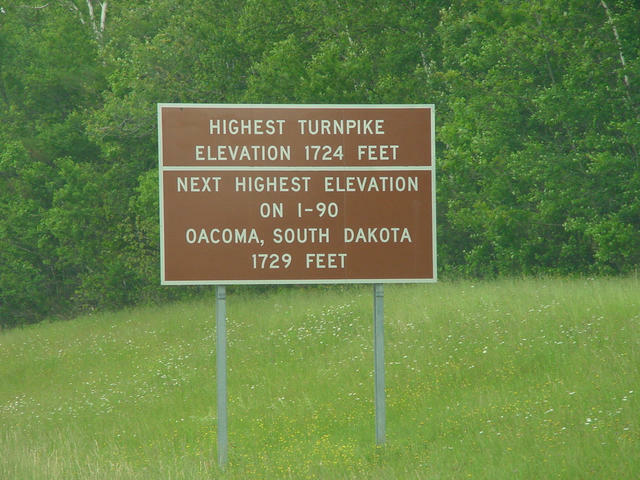 After I got home, I sent a note to the South Dakota Department of Transportation suggesting that they erect a complementary (and gramatically-correct) sign in Oacoma. I have no idea if they did so—I haven't been back to Oacoma since.